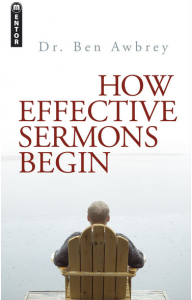 I thoroughly enjoyed reading a book on homiletics again. I’m reminded how relevant these books are to us, regardless of how long we’ve been preaching. Ben and Lisa Awbrey live in Kansas City, where he now teaches, and we enjoy their fellowship often. While pastoring in California Ben taught homiletics at the Master’s Seminary and the book is forwarded by John MacArthur and Richard Mayhue. This book is an encyclopedia of quotes and anecdotes from great preachers past and present. I especially appreciated his critique of “the noxious weed of inductive-style preaching” that has plagued our pulpits for a century now, rather than expository preaching which “is rampantly deductive.” Ben’s use of the thesis-interrogative-keyword approach to using a proposition reminds me of our James Braga textbook in seminary.